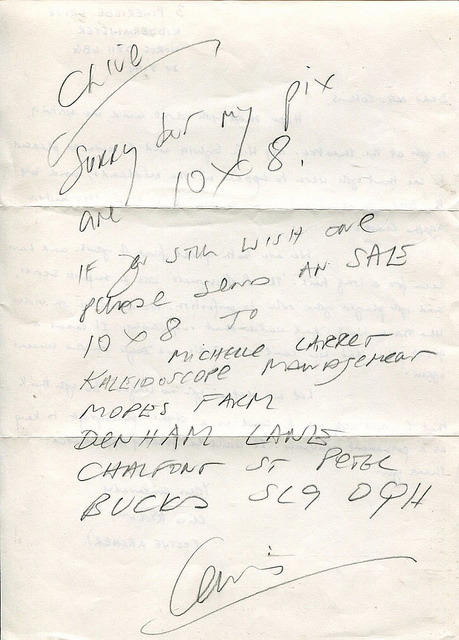 Yesterday this hand written letter by Lewis sold on ebay for… - BODIE 3.7 . you'll never walk alone ! I think it's neat that it's his now-wife who was handling the requests. aww thankyou, how sweet of you but the price was going up and up and then somehow you get sucked into a bidding war so i backed out on this ocassion. Yes it is and i wonder what "pix" he was offering . Ahh, too bad. I'm sure you would have been a good home for it! never mind , it would have been lovely to own tne original but i could sense a bidding war starting, it's nice to look at though. Interesting to see! Did he write that on the back of someone's letter? yes he did, obviously this person called Clive must have been enquiring about an autograph and this is Lewis's reply.It's really lovely (for me) to see it. awww i know, i love to read little insights like this reply to a fan and it would have been lovely to own it but a bidding war was out of the question. Judging by the writing, he must have dashed this off (I expect he had loads). Not sure about the grammar - it threw me at first, but I think the first bit is saying 'Sorry but my pix are 10x8'(which is interesting in itself, because you'd expect 8x10 - I wonder if that was right or just a quirk of speech). Anyway, read like that it makes perfect (if scribbled) sense. 'If you still wish one...' etc. It's a lovely snapshot of a moment in time - it's always the unconsidered ephemera which come to mean the most with the passage of years. no doubt about it but i love to see such things as this reply written by lewis and it made me laugh when i saw how he had written "pix" and how he uses the phrase "if you still wish one" and like you i wonder which picture he was signing. I do have in my collection a few autographed images of him that i have collected over the years and they are always lovely to keep. I use 'pix' myself, but it is an odd juxtaposition of the informal and the formal. i know i have used the word pix in brief text when i'm leaving a quick message. Thankyou, believe me they are well treasured.